When you're using Quick Base, one word you hear again and again is TABLE. What's a table? A table is a container that holds information about like items. For example, an Employees table would contain the same basic details on each employee: name, title, department and so on. Each detail, each chunk of information you need to store lives in a field. 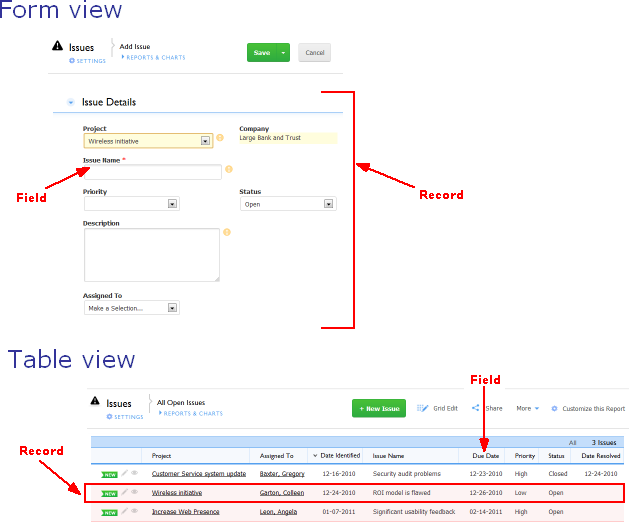 When you view a single employee record, Quick Base displays it in a form. Whenever you want to view more that one record at a time, you do so in a table report, where fields appear as columns and each record is a row. Note: You should give your table a pluralized name (such as Projects, Tasks, Products, etc.) because the table will contain multiple individual records. For instance, the Tasks table contains many Task records. To understand tables better, step back in time. Before you used software to manage your business, there was a lot of paper flying about. For example, imagine that in 1952, old Aunt Beatrice was younger than you are now and ran billing for her company. What did she do? Well, probably she typed and mailed out a lot of paper invoices. Then she grouped them in manila folders to keep a record of sales. These folders were organized in a filing cabinet for easy retrieval. Great. But if you're sending invoices, there's probably a lot of other information you need to track like customers, products and so on. Where does this information go? Well, since you probably track lots of information about your customers (like address and buying history) you'll probably want to create a Customers table to hold all those similar details. Likewise, Products have their own set of information you need to track like price, model number and so on. Again, product information belongs in its own table. You can create this data in Quick Base, or if your Product or Customer list already exists in another service, like QuickBooks Online or Salesforce.com, you can create a connected table to bring this data into Quick Base. You can schedule automatic refeshes of this connected data or refresh the data manually, any timeyou choose. Connected tables are not available to accounts on the Quick Base Essential plan. You may ask: Why can't I just store Customer information in the Invoice table's Customer column? It might seem more efficient to track customer info in the invoices table. It does save the need to create another table. But chances are you want to track more than just the customer's name. There's the address, telephone number, key contacts and more. 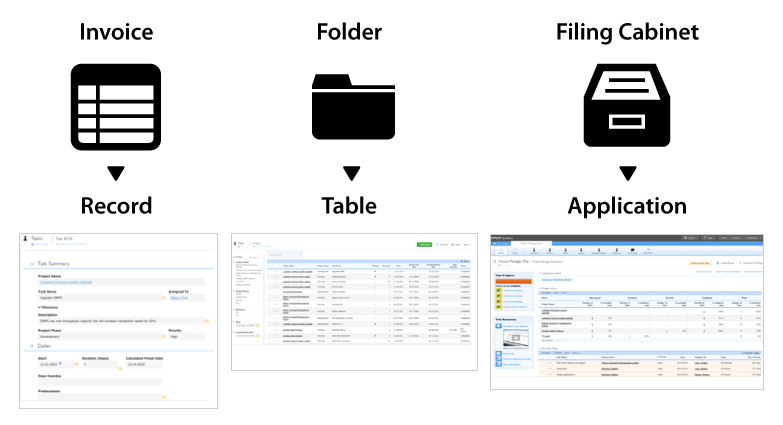 Will you create additional fields for these details in your invoices table? Doing so will take up more space as you'll be entering the telephone number over and over again, but that's not the worst problem you'll have. What happens when that phone number changes? You record the new number in today's invoice, but all the old invoices have outdated information. How does your assistant know which one to call? What a mess! It's much better to store that customer's information in one place: a record in the customers table. That way, there's only one telephone number to change. But with your information stored in separate tables, how can you tell which customer bought which products? Quick Base makes it easy to connect tables that contain related information. To do so, create a relationship that links the tables together. Then you can connect individual customers with product sales and invoices.